Vomo Island Resort is an exclusive private island with luxuriously appointed villas along a stunning beach and built into the hillside offering tranquil ocean views. This stylish resort offers exceptional service, a romantic bar and restaurant setting and some unbelievable snorkelling reefs surrounding a tiny uninhabited islet off the point and accessible by boat or kayak. 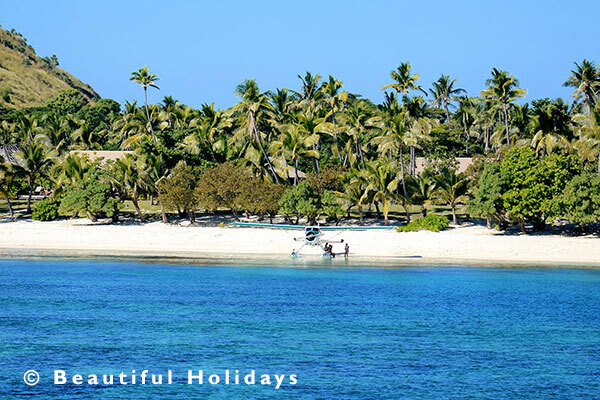 This is Fiji's most accessible private island resorts and one of the few upmarket resorts that allow children all year round. The Hillside Villas are reached via a winding pathway through landscaped gardens and offer brilliant views over palm trees to the ocean beneath and of distant islands. These villas are fully air-conditioned with contemporary Fijian designs, wooden floors and high ceilings. The open plan main living area includes a King size bed draped in mosquito net with a separate dressing area off the en-suite bathroom which features a jacuzzi style bathtub and separate shower. A lounge area at the front of the villa opens up to a private wooden veranda with sun loungers and views of the ocean. These fully air-conditioned beach front villas are set a few metres back from the beachfront with a small garden lawn to give a more private feel to the villa. Interiors offer contemporary Fijian designs with wooden floors and high ceilings. The open plan main living area includes a King size bed draped in mosquito net with a separate dressing area off the en-suite bathroom which features a jacuzzi style bathtub and separate shower. A lounge area at the front of the villa opens up to a private wooden veranda with sun loungers and views of the ocean. Located at the eastern end of the island in a very secluded setting at the base of Mt Vomo, The Royal Villa has three King size bedroom, a separate lounge with entertainment centre and a landscaped veranda with a private swimming pool boasting tranquil ocean views. Located in a private setting and on the beach front, The Residences can accommodate up to eight people. These four bedroom villas have large fully equipped kitchens, a separate lounge with entertainment centre and spacious outdoor lawns with a private swimming pool making this the ultimate luxury getaway for friends or families. The resort has a large swimming pool, floodlit tennis court, a 9-hole chip and putt course, croquet lawn and fitness gym. Complimentary snorkel equipment with daily excursions to explore outer reefs, kayaks, windsurfing (which has some exceptional wind passages offshore), Hobie Cat sailing boats and stand-up paddle boards. The resort also provides a PADI scuba diving service, game fishing charters and island hopping tours to visit remote fishing villages.